The slippers are done! I put little laces in so I can wear them with the tops up or down, and keep my feet warm. I might replace those with buttons later. I might also add non-slip soles. Each square in the pattern was about 4″ x 4″ before felting. That might help those of you who are figuring how big to knit your slippers. 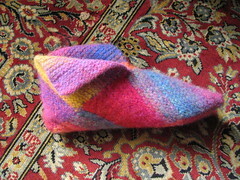 The resulting slippers are about a US size 7 (women’s). If you have a Ravelry account, you can see my project page here. There are more pictures at Flickr. I’m working on a pair of slippers from the new issue, 05, of CRAFT Magazine. 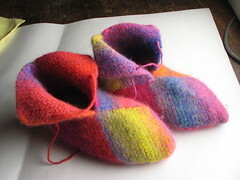 In the mag, they are called Easy House Slippers, and they are made with two colors of yarn. But I’m taking the opportunity to use a few skeins of Noro Kureyon that have been frustrating me for a long time. None of my other plans for them have worked out, and I have been disappointed with the colorway (102), which is just terribly garish. For slippers, it should be fine. Loud, but fine. I am using 2 skeins, and alternating, so each square is recognizably a different color combination. Read on past the jump for more details and photos. 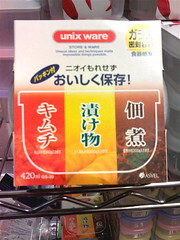 This photo of mine, of some glassware with an interesting (and geeky) brand name, just got posted on BoingBoing. If any BoingBoing readers are visiting, hello and welcome! Sorry, there’s a lot of knitting stuff here. But other things too. And there will be more. Just a quick note. I didn’t get around to posting the rest of the European trip stuff yet, because I had an oh-so-exciting trip to the emergency room instead. This was followed by a fascinating guided tour of an operating room, a brief sojourn in a recovery room, and a restful time in a hospital room with a lovely view of the TV towers on Seattle’s First Hill. This place was called “Swedish”, but looked nothing like IKEA. And I didn’t get Swedish pancakes and lingonberry sauce either. But they got my appendix. Bye appendix. We had some great times together. If necessary, I blame this post on the post-op pain meds. Well, Germany for one. And Austria for the other. And since then, lots of work to catch up on to make up for the time while I was gone. (And for the knitters — I got my Ravelry invitation while I was gone, so that’s been taking up a bit of my time as well.) 😉 I’ve been back for just over a week, now. I do want to post a bit about the trip in the upcoming days when I have time to do it. 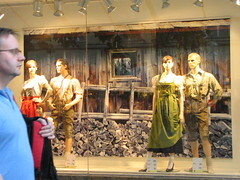 For now, here’s a photo of something I found a little odd; high fashion mannequins wearing traditional Bavarian clothing. (There were a lot of window displays like this. It was Oktoberfest time, you see. There were also a lot of people actually wearing these clothes, completely unselfconsciously and non-ironically, because that’s what you wear to the festival! To my cynical American eyes, this was odd but also rather nice. It almost made me want to don a dirndl.